What makes a perfect meal? 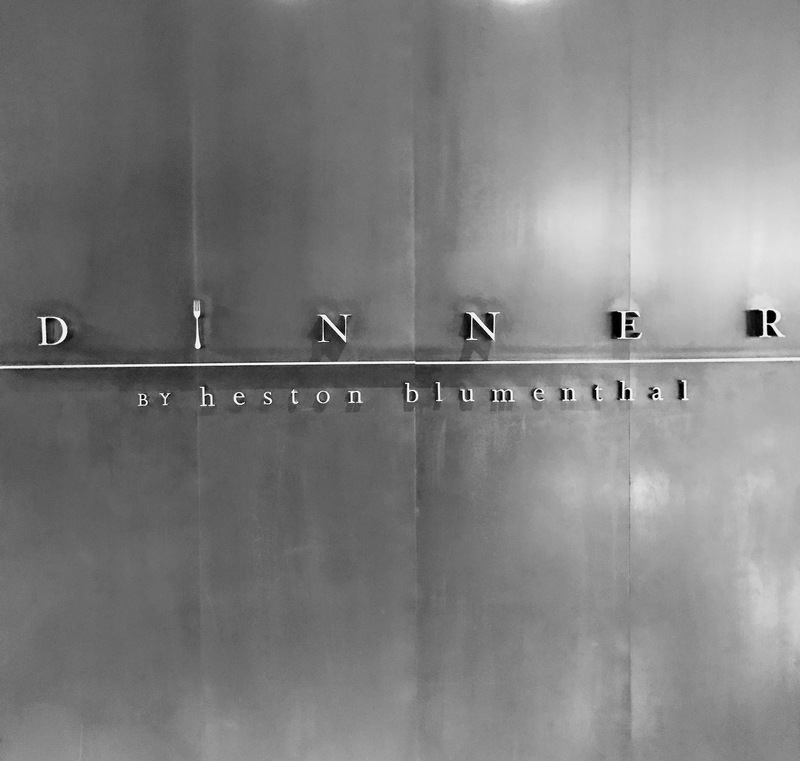 Sensory trickery, delicious bites, pressing the envelope, great conversation, reality checks, excellent service. Check. Check. Check. Check. Check. Check. 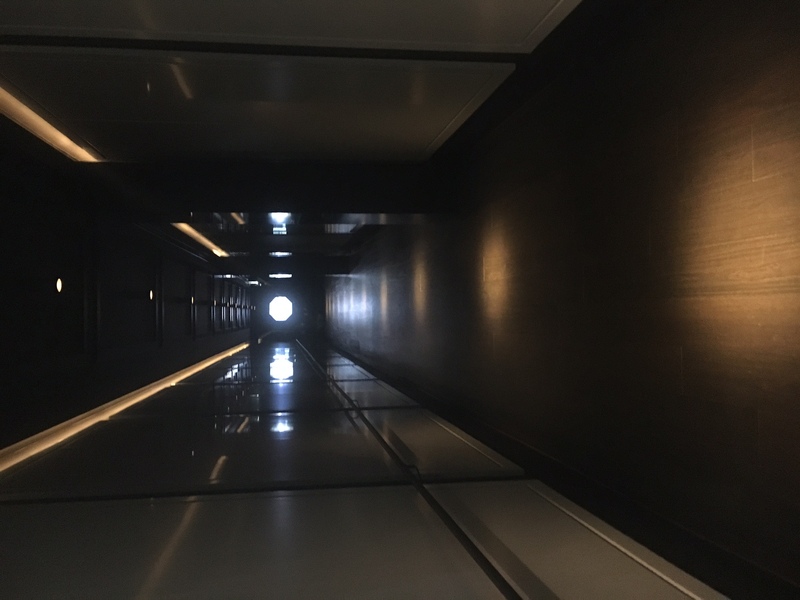 A few floors up in the maze that is The Crown Casino Melbourne is a slick corridor to Dinner By Heston Blumenthal. Well then. This glass of wine WAS in fact the Bloody Mary I had ordered and it was quite complex as if I was sipping a spicy red mix with peppery-notes, olives, pickle, celery and vodka. Thoroughly impressed. We were off to a solid start with the sensory trickery. The menu is served à la carte. We discussed the offerings and created a strategy before ever even arriving to the restaurant and it all hinged upon our mood that particular day. How hungry were we? How curious were we? How many of the desserts couldn’t we miss? By the time we were seated, we knew exactly what we wanted and Brandon always takes the lead on ordering for the two of us. He’s old fashioned in that way which I really like. He always stands up from his seat whenever I leave or approach the table, I feel honored whenever he does either. One of those simple gestures that makes a girl feel cherished. He’s been showing these subtle acts of respect since the night we met and I simply treasure his charm. I married the perfect human, but that’s for another memoir – our Bora Bora recount is coming soon with our wedding anniversary vastly approaching. We begin. The Frumenty arrived. 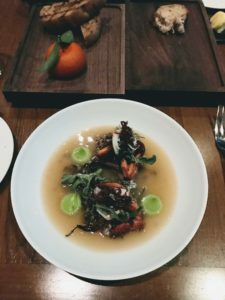 A tender, delicious, savory octopus resurrected from year 1390 apparently inspired by King Richard II. 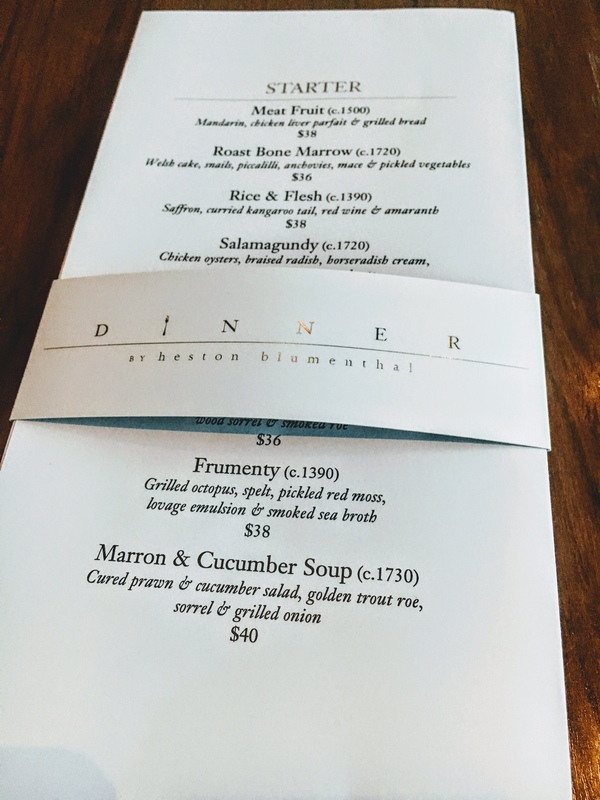 BTW, the point of the menu is to bring to life centuries old dishes with a modern twist. Pretty inventive. Next, course two, the gorgeous Meat Fruit showed up which we’ve enjoyed previously in the Mandarin Hotel London. 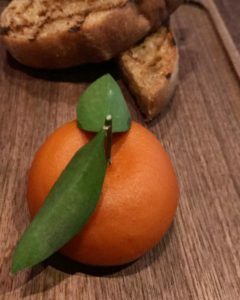 Always a rewarding choice with the flavor of oranges enveloping a chicken liver parfait to paint on toast. Third course, Rice and Flesh crossed our palate. 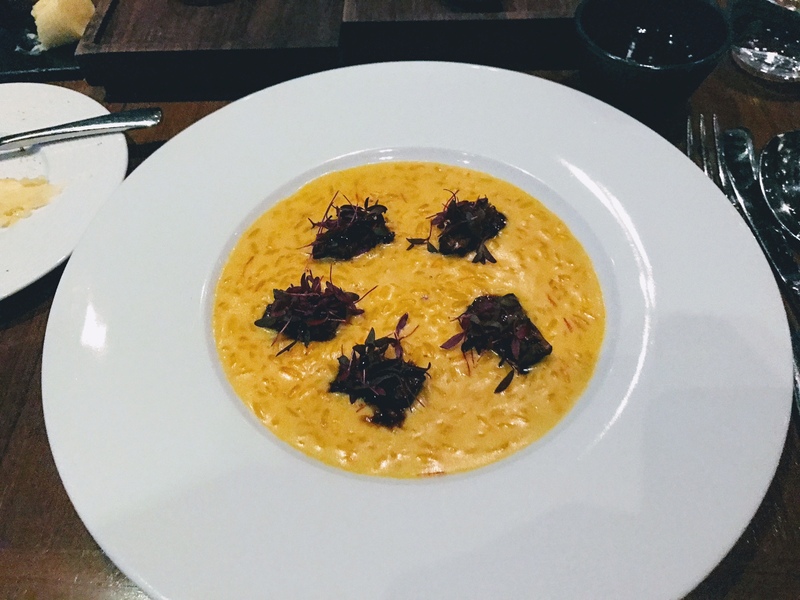 A dish inspired from year 1390, the reign of King Richard II. The flavor-rich, tender meat of kangaroo-tail atop a rice-soup mixture. Divine! The Main, our course four, was Braised Celery. Normally we’d scoff at a restaurant trying to pass off celery as a main, but we trust Heston and he worked his magic presenting a texture-rich, flavor-punch of a dish. Parmesan, walnuts, roasted radishes and cider apple. Tartness that kept the fork flowing freely from the plate to the palate, assembling mega bites as we explored ingredient combinations. We loved it. We were pleased. We gazed around the restaurant and spotted fries on a table close by. How’d we drop the ball on that one? We placed a rush order. 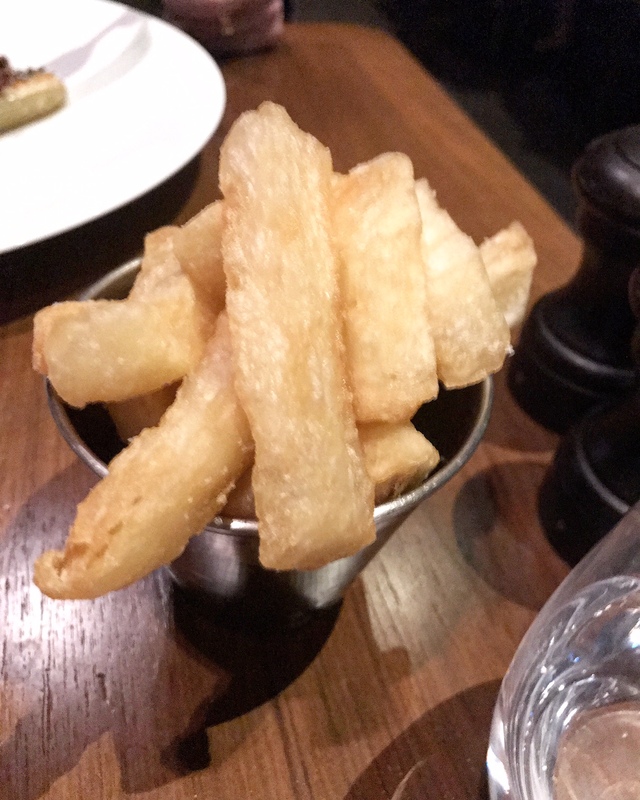 Voilà, fries appeared. Now for the fun and focus of our night – dessert. We intentionally ordered one main to split so we could indulge in three desserts. We attended Ashley Palmer-Watts Master Class a few days prior and spent a few minutes talking with him. He recommended the Tipsy Cake (he felt it was even better than in London) and thought we shouldn’t miss the Egg in Verjuice, so we followed his recommendations. We also wanted to press the envelope and understand what the fuss was about locally, so we skipped the liquid nitrogen ice cream cart in lieu of the Vegemite Ice Cream dish. A huge, huge mistake. All three desserts arrived at the same time. 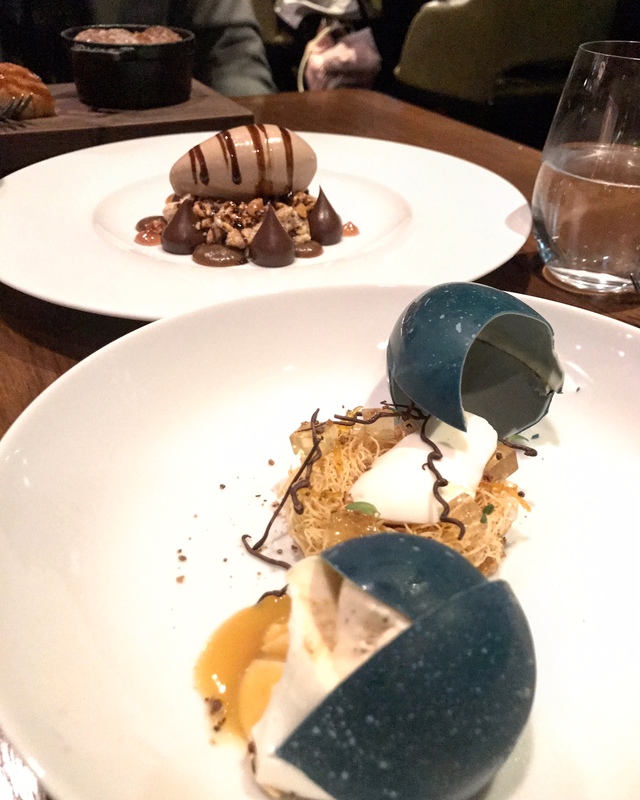 Three gorgeous desserts stood at attention on a tray in the air, but the first dish placed before us was the Eggs Verjuice. This dish required diner participation (click download file if viewing on mobile). 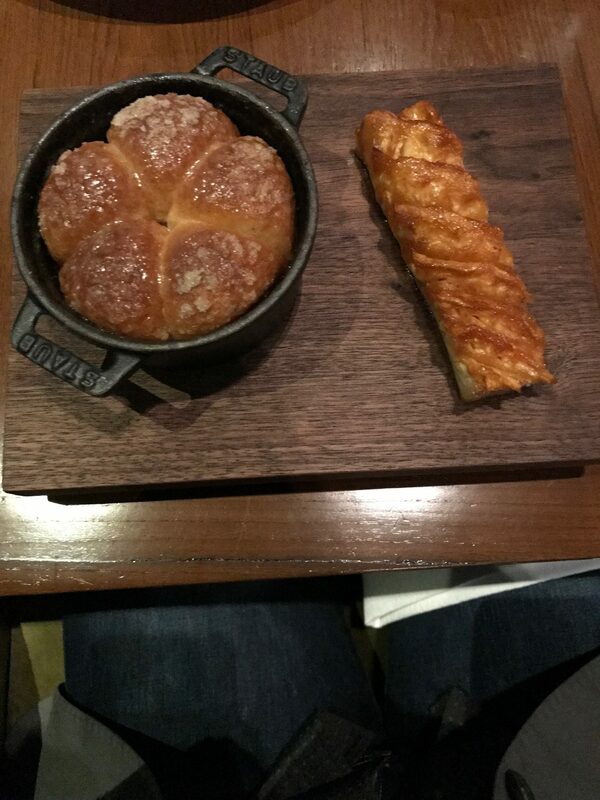 Lastly, the Tipsy Cake in all its glory! Dynamite! We teed up our first bite of Vegemite Ice Cream. Hmmm. I got out my phone and started googling. What was it with Vegemite that anyone would desire to eat it given there are other choices? People think it’s healthy and those born into it apparently like the taste spreading it generously on toast and drizzling it on ice cream. 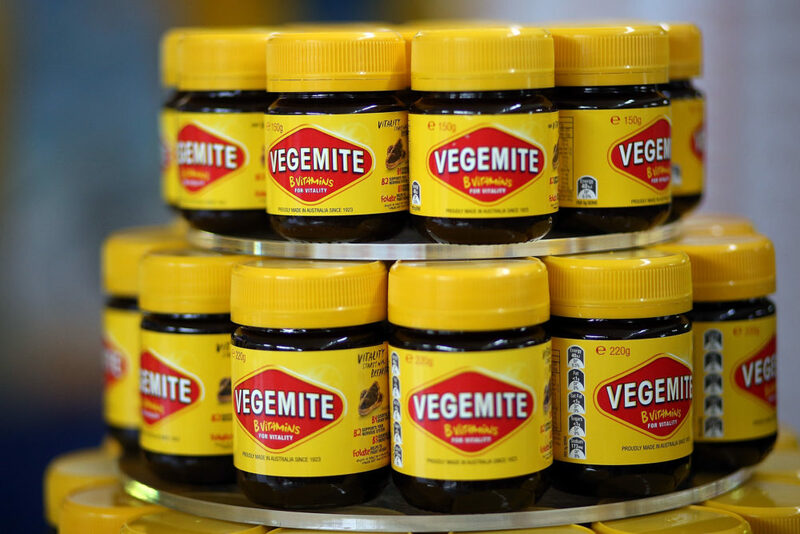 To our shock, we learned that Vegemite is a half billion dollar industry. Parts of our tongue awoke and our olfactory was on high alert. My conclusion as an American is that Vegemite tastes brutally tart, too bitter to be palatable. 🙂 One bite each, our curiousity was satisfied and we knew for certain that Vegemite wouldn’t make the Woodward’s future wish list. I am laughing as I type this. Here’s the deal, the problem wasn’t with the Vegemite, the problem was with us. This dish is absolutely gourmet, but due to our untrained tastebuds, we weren’t able to appreciate it. We left the center dish to slowly break down and melt away on its own as we ate around it discussing cultural differences between America and Australia, happily enjoying our Eggs Verjuice and knock-your-socks-off pineapple, brown sugar batter known as Tipsy Cake. For so many reasons, beyond what I’ve captured here in words, this was one of our favorite meals and even the sobering pungency of the vegemite just made everything that much more appreciated, appetizing and delicious. See, it’s all relative and sometimes you just need to get out of your comfort zone to be jolted back to reality and appreciate the hand you’ve been dealt – the one in the western hemisphere where people don’t need to eat yeast spread because there’s a zillion better options to go about ingesting your daily dose of B vitamins. hahaha! Kudos to the people who like the taste! Been there. Done that. It’s a good story, but we’re not up for training our tastebuds. When you go to Dinner by HB, if you’re not feeling brave, just stick with the liquid nitrogen ice cream cart or ask to hold the vegemite drizzle because the base dessert was delicious. We were so happy to have had the opportunity to try Vegemite prepared by the Mad Hatter. Relative to London, Heston Blumenthal Melbourne is an amazing date night location with a beautiful view of downtown and the Yarra river and a deeply satisfying menu curated by the 2017 Diner’s Club Lifetime Achievement Recipient, No 36 best chef in the world, Heston Blumenthal. 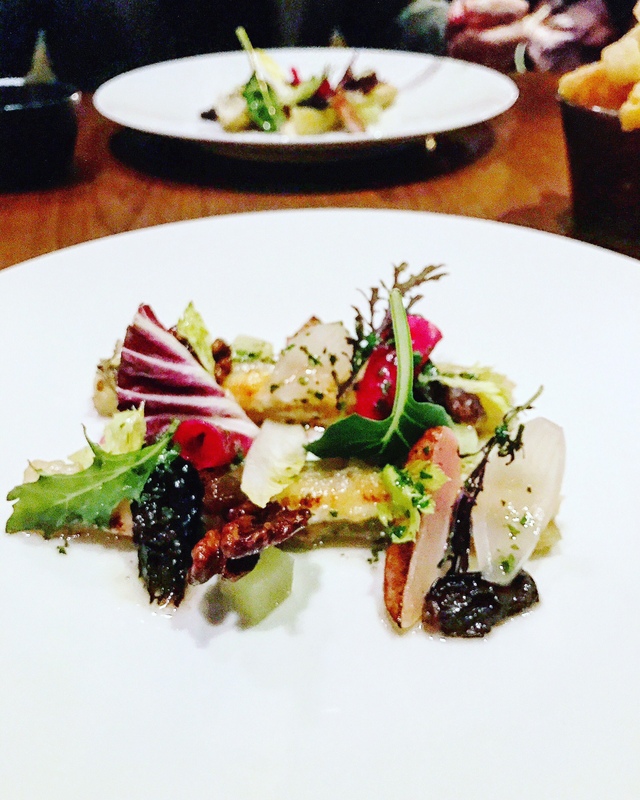 We’d put this restaurant on our Melbourne radar time and time again appreciating it for what is it, an outstanding, envelope pushing, sensory tricking, one-of-a-kind experience. Next Next post: 72 Hours in Melbourne : Where to Eat!